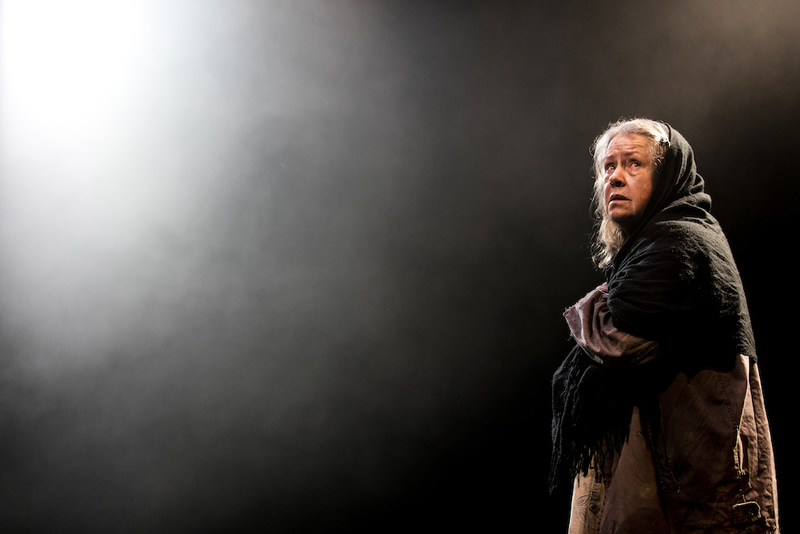 Noni Hazlehurst delivers a brilliant performance in this heartbreaking story of loneliness and isolation. Dead gum leaves litter the stage and the air is thick with the sound of crows as a lone, barefoot figure shuffles among the milk-crates, cardboard boxes and bags, largely ignored by the audience – who file in, chat and take their seats – as she potters around the detritus, her smudged fingers twitching. 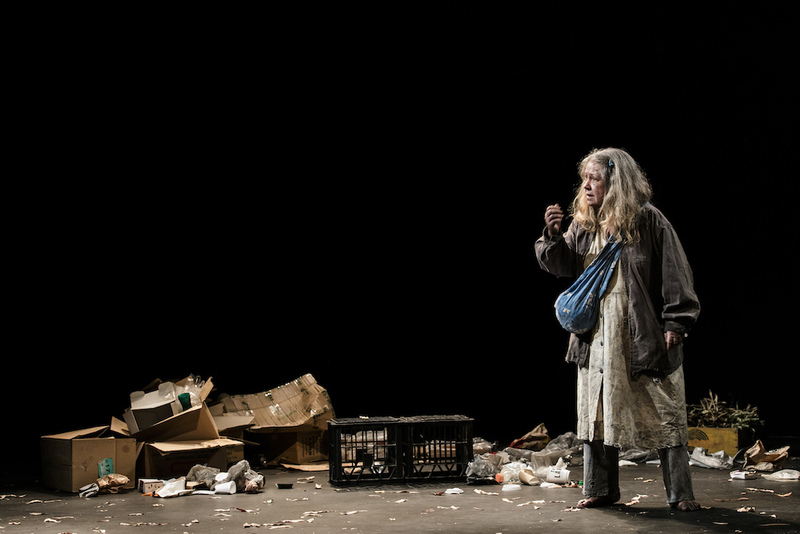 Christie – the homeless protagonist of Australian playwright Daniel Keene’s one-woman play Mother at Belvoir St Theatre – is just another part of the landscape until the lights go down and with a shout the focus is all on her. While breathtakingly simple, the device immediately draws attention to the way we see – or don’t see – the more vulnerable members of our society. 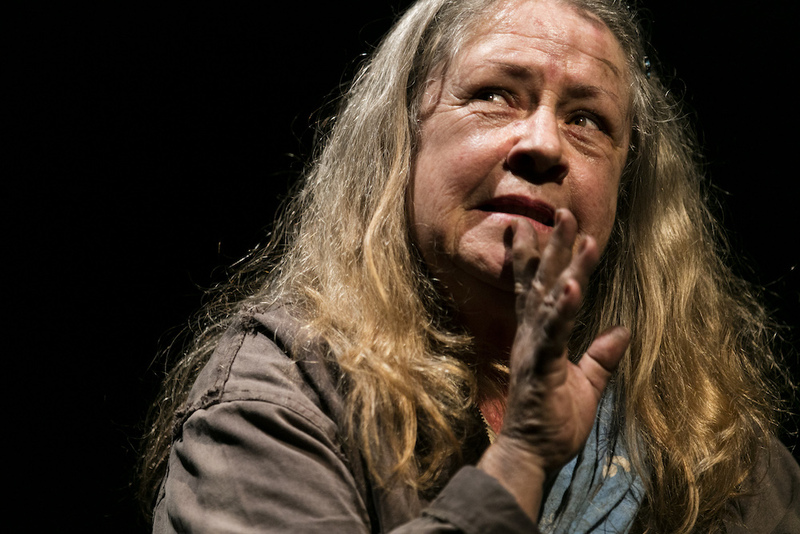 Beloved Australian actor and presenter Noni Hazlehurst gives a harrowing performance as Christie, who tells her story – one of poverty, alcoholism, abuse and love – in a series of scenes that lurch gently from one to another thanks to Matt Scholten’s careful direction (as well as Tom Willis’ sound design and Darius Kedros’ sensitive lighting). Keene wrote the play specifically for Hazlehurst, whose performance was nominated in the 2016 Helpmann Awards, and she disappears into the role with frightening verisimilitude. Kat Chan’s set is backed by light-sucking black curtains that give it a slightly abstract feel – a familiar scene, floating in space – but Hazlehurst’s characterisation is rendered with incredible precision. She brings Christie to life with her every movement – from her careful, slightly unsteady gait, to the way she holds her fingers or clutches at Chan’s achingly drab costuming. Christie’s story accumulates in vignettes – she tells us of her husband, her mother, his sister, the neighbour who supplies her with a drink made from turpentine, and most importantly her son. Her narration is distinctive and energetic as she conjures the other characters in her life, the rhythm of her conversations with them utterly convincing. Her anecdotes are by turns devastating, tender and touching – though even the fondest memories are coloured by her present situation – and while she turns a sharp wit to her dealings with her husband, her jokes often slide off into something darker. There is a drifty quality to the timeline, the hazy scene changes like soft-edged blackouts. While Hazlehurst’s performance is brilliant, it’s also Keene’s deft use of language that brings Christie to such vivid life. The way she describes her world and interactions – the metaphors she employs to spear her husband’s sister, for instance – are wonderful. But there are moments, particularly as the play reaches its denouement, when overly florid dialogue draws attention to the artifice rather than the human story at the play’s centre. Mother is a heartbreaking story of loneliness and isolation, a story that could be playing out in any number of variations across Australian cities. Christie might shine an unsteady light on her own failings, but at every tragic step of the way the broader shortcomings and brutal indifference of a society that has done little to prevent her fall (or provide the support she desperately needs to recover from it) share the spotlight. This adaptation of Erdman’s The Suicide fails to plumb the depths of its characters’ despair. Michelle Law’s incisive debut play will have you in stitches then tears. The Company is returning the Downstairs Theatre to indie artists, among other investments in the future of Australian theatre. The "fierce young theatre maker" will explore themes of vengeance and sexual assault in a new, commissioned play.